Directions Oakhill Day School is in Gladstone (North Kansas City Area). PARKING is in front and in back of the school. Walk up the stairs from the back parking lot to get directly to the Gym. DO NOT PARK in RESERVED Parking spaces. Clocks and sets will be provided. There is a warm-up BugHouse side event at 10:00 AM. 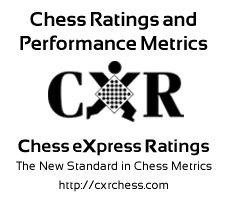 The Main (CXR-rated) Event starts promptly at 11:30 AM. Refreshments will be available. Books and equipment will be available for purchase.